Soon after he became Pope, Pius XII had to face a United Front of German Bishops that was adamant about promoting “active participation” in the liturgy in defiance of ecclesiastical law. Numerous liturgical abuses were already flourishing unchecked in their dioceses, fueled by the subversive efforts of progressivist liturgists and theologians from the German-speaking lands: notably Abbot Herwegen and Dom Odo Casel of the Benedictine Abbey Maria Laach, Frs. Augustin Bea, Romano Guardini, Karl Rahner, Joseph Jungmann and Pius Parsch. In spite of the reigning liturgical anarchy, the German Episcopal Conference, headed by Card. Bertram, took the Liturgical Movement under its wing in 1940 and created its own Liturgical Commission, which operated independently from the Holy See. To form an idea of how far the mutinous German Bishops had plunged their dioceses into liturgical chaos, we can consult the 1943 Memorandum (1) written by Archbishop Conrad Gröber of Freiburg addressed to the German and Austrian Bishops and also to the Roman Curia. Archbishop Gröber had broken ranks with his confreres in the Episcopal Conference and vehemently denounced the radical innovations in doctrine and liturgy practised by the reformers. He was voicing the complaints of many German Catholics who objected to liturgical changes in their parishes. In his Memorandum he showed how the Liturgical Movement was a showcase for liturgical corruption directly related to the adoption of Protestant principles, (2) thus creating a lethally divisive culture of schism within the clergy. (3) It is noteworthy, though not surprising, that all the doctrinal deviations Archbishop Gröber mentioned as prevalent in 1943 were an exact replica of those that influenced the creation of the Novus Ordo of 1969. After all, many of the key figures of the Liturgical Movement would be promoted as periti (experts) at Vatican II. As for the liturgical abuses, we can consider one of the most egregious – the singing of hymns in the vernacular during Mass, which was a long-standing custom in Germany. According to Archbishop Gröber, the German Bishops insisted on vocal participation of the congregation – even to the point of making it obligatory – and the use of German in the Mass. The fact that this had been expressly prohibited by Popes Leo XIII and Pius X and confirmed in the Code of Canon Law (4) was completely ignored. Even though the Holy See, since the Council of Trent, reserved to itself the right of legislation in the domain of the liturgy, orders from Rome were regarded by the German Bishops as an intolerable intrusion of papal legislation and a threat to their supposed autonomy. Celebration of the Easter Vigil ceremonies in the evening. 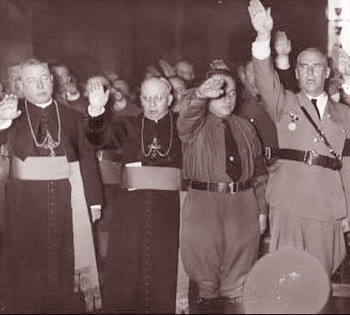 Pius XII must have been aware that these abuses were already in vogue in Germany, as in addition to Archbishop Gröber’s analysis, strong objections had been published by conservative priests representing the concerns of the laity. (5) Nevertheless, Card. Bertram hoped to put pressure on Pius XII to authorize these reforms, and, as events have shown, his hopes were fulfilled. He received an immediate reply from the Vatican permitting the High Mass (Deutsches Hochamt) to be sung in German by the congregation. So what had been illicitly done in defiance of Canon Law up to 1943 suddenly became an approved practice. It was the same principle under which Paul VI would capitulate to pressure for Communion in the hand, Mass facing the people, laicization of priests etc. Regulations were being widely flouted, so why bother trying to maintain the rules? 1943 will go down in history as the year in which the Church at last gave in to the Zeitgeist or spirit of Progressivism that had been threatening to engulf her since the time of Pius X. The German Bishops were demanding the freedom to “do their own thing.” And so the authority of the Roman Pontiff and the sacredness of the traditional liturgy had to be set aside to accommodate a changing and worldly liturgy said in the vernacular, which would enshrine the Cult of Man. Let us not forget about the impact of these papal concessions on the traditionally-minded Catholics of Germany: The rug was pulled from under their feet as they found themselves disavowed by their Holy Father. The whole enterprise was an ecclesiastical disaster in the making. The Pope tried to control the German Episcopal Conference by reprimanding liturgical abuses, imposing shambolic restrictions and experimental periods. But the German Bishops tossed them all aside to indulge in unlimited freedom to regulate their own liturgies. It is obvious that these papal actions against dissident reformers, while tolerating their abuses, were totally illogical: The message was fatally mixed. If infringing Canon Law and disobeying papal commands could be so easily tolerated in Germany, why should progressivists elsewhere be targeted for papal criticism? And if using the vernacular in the German-speaking lands was widely permitted, why should the inhabitants of other countries be prevented from using their own languages in the liturgy? Even though Latin remained “officially” the language of the liturgy, the situation quickly descended into farcical chaos. There followed a concerted effort in the 1940s to storm the Vatican. Overwhelmed with requests from many countries, Pius XII increasingly permitted the use of the vernacular in the liturgy. (7) For those who decided to short-circuit the system and not bother to ask permission, no action would be taken against them for breaking the law. The same scenario would be repeated after Vatican II with permission for altar girls, Communion under both species etc. when Popes rewarded disobedience and encouraged contempt of ecclesiastical law. The 1940s were also a time when national hierarchies – particularly the French and German – were rallying their combined forces to mount an all-out assault on Roman control of liturgy. It may seem to some people surprising or a trifle hyperbolic that the language of battle should be employed to characterize the situation, but it cannot be denied that the pre-Vatican II reformers saw their mission in these terms. These are certainly fighting words, revealing the intention of the Liturgical Movement to wrest control of the liturgy from the Holy See, yet they were not matched by any joint action or correspondingly militant spirit of opposition from the Vatican. There was no one there to fight the battles that needed to be fought. 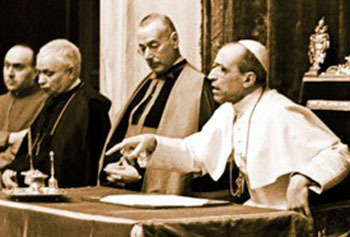 Faced with mounting pressure from the leaders of various liturgical cabals, Pius XII would blow an “uncertain trumpet” (9) in Mediator Dei and follow a policy of appeasement. Hubert Jedin, History of the Church, London: Burns and Oates, 1981, vol. 10, p. 303. These included presenting the essence of the Mass as a Meal; exaggerating the priesthood of the laity and promoting the notion that “it is the community that celebrates;” disparaging the ministerial priesthood and reducing the role of the priest to one delegated by the parish to preside at Mass; rejecting private Masses and devotional prayers (the Rosary, Stations, etc); extending the limits of the Church to include Protestants, considering heretical sects part of the Church; redefining the faith as no longer belief in revealed truths, but an experience, an emotion. 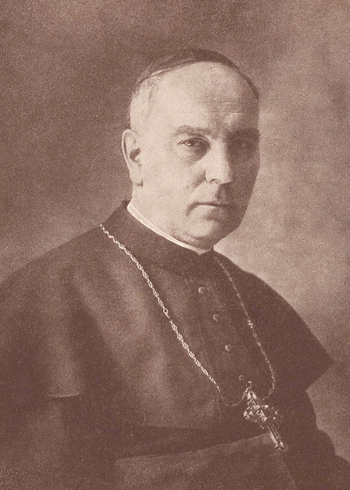 Romano Guardini also attempted to counter Archbishop Gröber’s criticism of the Liturgical Movement in a letter to Bishop Stohr of Mainz. (See La Maison-Dieu, Paris: Editions du Cerf , 1945, vol. 3, pp. 7-25) Bishop Stohr was head of the German Liturgical Commission, an organization that had been set up in 1940 independently of the Holy See. It provided a vehicle for communication among the leading members of the German Liturgical Movement and a common front against attacks on the Movement. The singing of hymns in the vernacular during Mass had been expressly forbidden by Leo XIII in the General Decree of the Congregation of Rites, 22 May 1894. See Fr. Max Kassiepe OMI, Irrwege und Umwege im Frömmigkeitsleben der Gegenwart, (Wrong Turns and Detours in Contemporary Spiritual Life), Kevelaer, vol. 1 (1939), vol. 2 (1940). Fr. Kassiepe specifically mentioned changes to the Confiteor and Agnus Dei, the Easter Vigil held on Saturday night, priests who used German in the liturgy for the Missa Cantata and the Missa Recitata and unjust criticism of the faithful who recited the Rosary or made the Stations of the Cross. This did not satisfy the German Bishops. At the request of the German Episcopal Conference, Fr. Romano Guardini produced a new Psalter (Deutscher Psalter) in 1950 in the vernacular. Vernacular versions of the Ritual were permitted by the Vatican in Germany (1943 and 1950), France (1946 and 1947), and the USA (1954), Liège (1948). In 1949, permission was granted to China for the Mass in Chinese. In 1950, India received permission to use Hindu for the celebration of the Sacraments. Apud Denis Crouan, The History and the Future of the Roman Liturgy, Ignatius Press, 2005, p. 136. The 1959 Congress was jointly sponsored by the Centre de Pastorale Liturgique in Paris and the Liturgical Institute of Trier, Germany. The main theme of discussion at the Congress was “The Problem of the Roman Missal.” Many ideas discussed at the International Liturgical Weeks found their way into Vatican II’s Constitution on the Liturgy and Gaudium et spes.